We've discussed skin-lightening in India before, but, according to The Independent, new skin-whitening commercials are igniting a "race row" in that country. The commercials feature three of Bollywood's biggest stars in a soap opera-style love triangle. 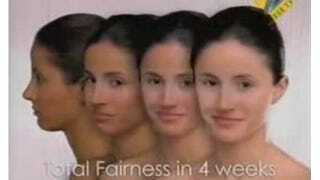 The dark chick is dissed for a lighter-skinned woman, so she turns to a product called White Beauty. The cream promises a "pinkish white glow," and the not-so-subtle subtext is that you need fair skin to snag a man. (Let's not forget the woman who killed herself when her husband called her "black.") And who manufactures this cream called White Beauty? Why, Unilever, the same folks who urge you to "love your body" in Dove ads. How is it they they can make "Love Your Body" Dove ads and "hate your skin" bleaching creams? Eh, we've previously discussed Unilever's hypocrisy. Meanwhile, it is important to reiterate that this ad is incensing for the same reason that the lack of black models in magazines and on catwalks ought to fill you with rage. As long as human beings believe that "fair" means "beautiful" — that dark is ugly and unfashionable — magazines and beauty companies are going to appeal to us with images of white skin. The more we see white skin in magazines and on catwalks, the more we'll believe that it is the ideal. I've posted about this before, but please: Watch this video by Kiri Davis, (fast forward to 3:40 if you have to) in which young children point to identical black and white dolls and proclaim the white doll "good" and the black doll "bad." It's a 2006 recreation of a 1950s test, with similar results.